As far as weather this weekend, all eyes will be looking north of the Mason-Dixon line. A storm down south moves through the mid-Atlantic today, intensifying tonight as it blows through the Northeast and New England. The system is a combination of a low pressure system off the Texas coast and the remnants of Hurricane Willa which joined forces during the past 48 hours. As the system continues its path up the east coast, a Nor’easter will take shape. A mix of rain, snow, sleet, and some icy conditions could cause travel problems in upstate New York, Vermont, New Hampshire, and Maine. However, the biggest impact from the storm for truckers will be the winds in coastal areas and in the big cities from tonight through Saturday night. The National Weather Service has issued Coastal Flood Watches and Warnings, and High Wind Watches and Warnings up and down the eastern seaboard. Truck drivers know how problematic strong winds can be, especially when hauling empty vans. The Federal Motor Carrier Safety Association (FMCSA) breaks down large truck crashes by weather condition (a large truck is defined as one with a gross vehicle weight rating of more than 10,000 pounds). The latest report shows that less than one percent of crashes in 2016 were caused by severe crosswinds, but these incidents killed eight people. It’s of particular concern in certain regions of the country where windy conditions are common, according to what some drivers told Business Insider this summer. Todd Davis, Senior Director of Sales and Marketing at U.S. Express (NYSE: USX), a top 10 for-hire carrier, tells FreightWaves that the majority of the company’s network is comprised of “drop and hook” type freight in which drivers haul loaded trailers inbound to a receiving facility, then drop the loaded trailer and hook to another trailer at the same facility. The hooked trailer can be loaded with freight, or it can be an empty one that the driver will “deadhead” to the next dispatch site. However, Davis says he tries to limit the latter as much as possible, especially through areas where winds will be strong. 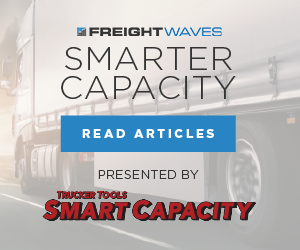 “A large focus of our network efficiency efforts are to minimize these deadhead situations and/or reduce the uncompensated mileage we travel during deadheads. In either event our trucks are not typically, or to a large degree, driving around with empty trailers,” says Davis. In order to emphasize safety, dispatchers at U.S. Express will send notifications to the drivers’ in-cab communications systems this weekend if local law enforcement agencies in the Northeast region close any bridges due to height restriction because of wind. “Our routing system can be edited to allow road segments that are impacted by weather or natural disasters to be restricted in route optimization calculations. Closed road segments will be detoured around by the route optimizer,” adds Davis. “Additionally we can geofence affected areas and send specific safety communications to trucks in those areas, or nearby, as to conditions and updates from area authorities.” Davis always urges drivers to slow down during high wind events, or pull over and park If it’s too much to handle. Here’s what to expect from the Nor’easter. People at truck shows should be paying attention, too. For Saturday shows in the Northeast region, washing and polishing should have been done outside today, or it could be done Saturday inside their workshops. Same for anyone who has Sunday shows - get washing and polishing done outside this afternoon, or do it inside on Saturday. The heavy rain and strong winds from the Nor’easter will be gone by early Sunday.